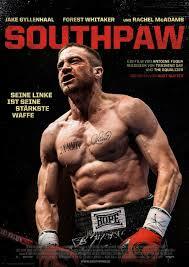 SOUTHPAW’s ringside boxing scenes are the least brutal part about this movie. Don’t take that the wrong way – the fight scenes are plenty raw and bloody (really bloody) – but the story outside the ring is dark, gritty, and bleak. The story opens on the Light Heavyweight boxing champion of the world in his prime, undefeated at 43-0, where luxury oozes with swollen eyes and stitches. The scene is modern, crude and gaudy. And it’s all about the champion, Billy Hope, played by an extremely fit Jake Gyllenhaal (NIGHTCRAWLER, BROKEBACK MOUNTAIN, DONNIE DARKO). A product of New York City orphanages, Hope is a rags to riches poster child and a tough-as-nails bruiser. He shares everything with his wife Maureen played by Rachel McAdams (MIDNIGHT IN PARIS, THE NOTEBOOK). They are absolutely perfect together, right down to the matching tattoos, and lend a tenderness to an otherwise garish atmosphere. In the first of what seems like 12 rounds of tragedy, Maureen is struck and killed by a stray bullet during a skirmish between rival boxing crews. It’s tragic and the movie makers don’t shy away from it. What follows can only be described as a downward spiral. Billy Hope takes a vicious, albeit cartoonishly dramatic, fall from grace. His team, including manager played by Curtis “50 Cent” Jackson, abandons him and he eventually loses custody of his daughter. Director Antoine Fuqua (TRAINING DAY, THE EQUALIZER) maintains his dark point of view in SOUTHPAW. Gyllenhaal is convincing as he claws and crawls his way through misfortune. His love for his daughter is moving. He’s also very convincing as a boxer, in fighting shape and powerful. Did I already mention fit? Okay, good. The circumstances surrounding the struggling fighter are a tad melodramatic. And it seems like writer Kurt Sutter (SONS OF ANARCHY) was just piling it on. Tragedy after tragedy, and knocking Billy Hope – and the audience – down another couple notches. It was successful in setting itself apart from other straightforward sports comeback movies. It was more modern and gruff than the Rocky movies or comparable sporty flicks. There are some familiar clichés though. A ratty old gym. Training montages. An old, wise coach played by Forest Whitaker (LEE DANIELS’ THE BUTLER, THE LAST KING OF SCOTLAND). Whitaker is steadfast and serious as a former fighter who had sworn off the professional sport. This sounds like a solid drama, but sports movies tend to be repetitive. They're no good, they practice, the succeed. What might set them apart is what happens in between those cliches. The tragedy upon tragedy element reminds me of Precious (2009) which had that same formula of tragedy upon tragedy that makes you wonder if a real person could take that much tragedy in real life. Still, extremely curious for this one.